Irma's Field Notebook: Happy Camper School - Br-r-r-r-r! Happy Camper School — Br-r-r-r-r! The sun came up 24 October 1999 around 12:45 A.M. after having set only 45 minutes prior to that. It will not set again until 21 February 2000. From now on it just circles around the sky. Without landmarks it is difficult to get your bearings. I thought it would be strange going to sleep with the sun still up, but it really does not bother me. By the way, I got transferred to a new dormitory with a window and a nice roommate, so living is much better now. I really love having a window. The view isn't so wonderful, but I have light. It is great. What's the point of having sunlight for 24 hours a day if you can't see it? We had to go out to Davis Camp again, but this time there wasn't anyone to drive with. So I had to go learn how to drive a spryte. 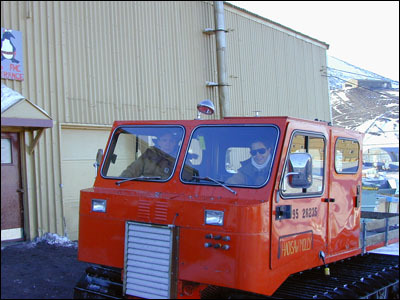 It is a funny little tracked vehicle and you drive it by controlling the brakes. There is an accelerator and a right hand brake and a left hand brake. It takes some getting used to, but I passed the course and off we went to Davis Camp. It was really great fun. 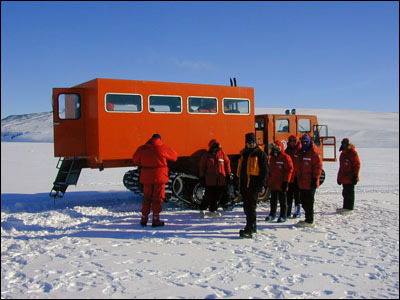 We only had to go out and hook up the generator so that they finally have power out there, so we weren't there for very long this trip. The seal in the meantime had gotten away and they were looking for him. They finally found him more than 2 miles away. He had gone that far to find another hole to breathe in. 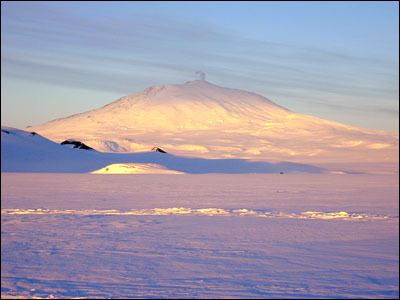 At the moment our runway is out on the ice of McMurdo Sound, but fairly soon the ice is going to start to break up. 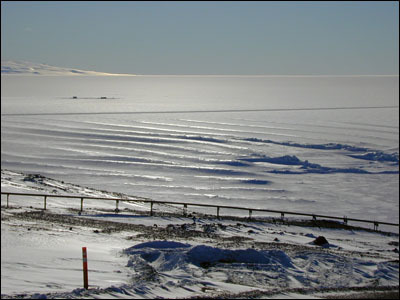 When that happens we will have to move the runway to the permanent ice on the Ross Ice Shelf. It is further away from base (about a 30 minute drive). We had to go out to that airport which is called Williams Field and begin getting them powered up so they will be ready for service. That was an interesting place and quite cold. We were miles out in the middle of the sea really. 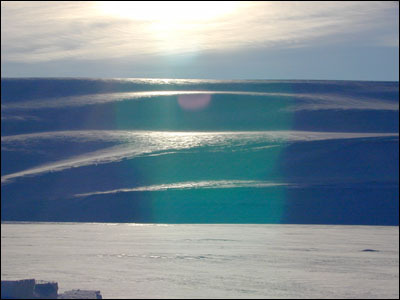 The Ross Ice Shelf is about the size of Texas and is really a very slow moving glacier. It never melts in the summertime. 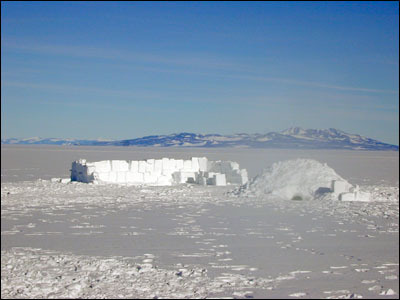 Williams Field, although it is on the ice shelf, is covered with very deep snow. The aircraft that will be landing there will all land on skis. There is another airport even further away which is called Pegasus. 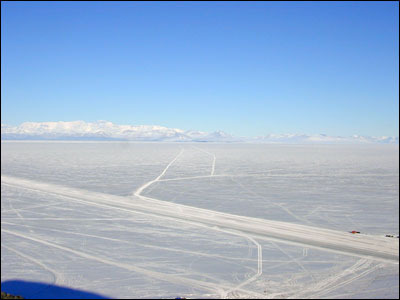 Its runways are made of ice like the one on McMurdo Sound. Planes can land on the ice with their wheels. 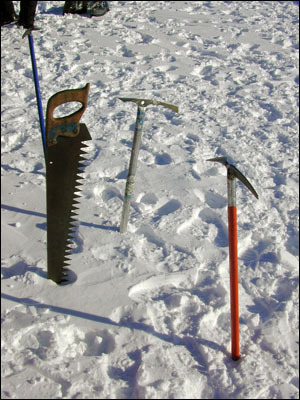 I finally got to go to Snow Survival School, better known around town as Happy Camper School. That was one of the toughest things I have done. We began the day with a lecture on extreme cold weather injuries where we learned more about hypothermia, frostbite and the like. They also taught us about the gear that is in our survival kits. 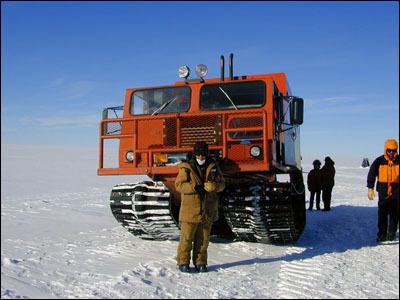 Then we drove out onto the Ross Ice Shelf in a funny tracked vehicle called a Nodwell. The first and most important thing to learn is how to build shelters for ourselves. 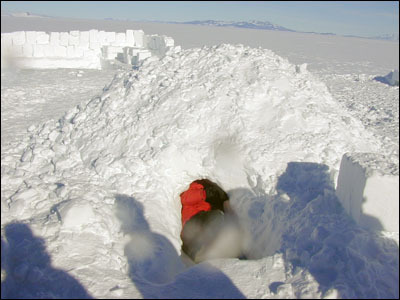 We had tents and sleeping bags, but not enough for everyone, so we had to build snow shelters. 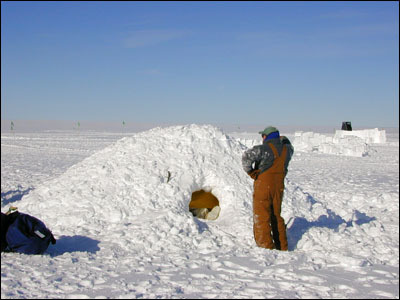 One structure is like an igloo where we pile all of our bags in a heap, throw a tarp over them, and then pile on the snow, packing it down as we go. 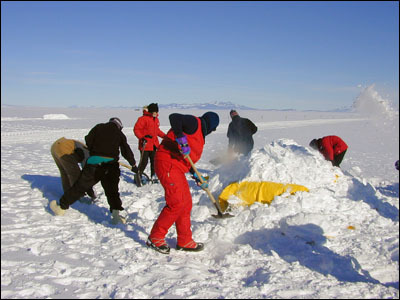 When we are sure we have snow that is about 2–3 feet thick, we dig a hole in the side and pull all of the stuff out. 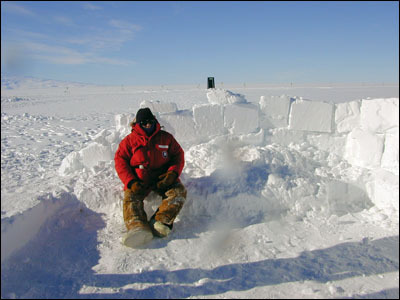 There is also another structure where you dig a trench in the snow and then cut blocks to go over the top of it. 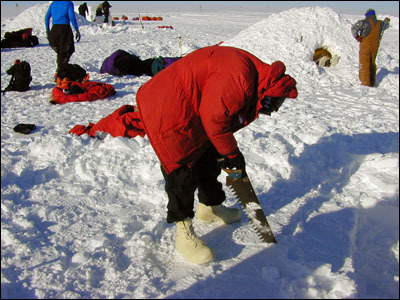 We also took large–toothed saws and cut blocks of packed snow and built a wall to surround the tents and shelter them from the wind. We then turned our quarry into a kitchen of sorts. Halfway through the building the instructors gave us a radio and then left us all out there. We continued building until about 10:30 at night (remember it is still daylight). We ate freeze–dried food for dinner, i.e., add boiling water, and then went for a walk to warm ourselves. All the hair around my face, my eyebrows and eyelashes had a layer of ice on them. Finally around 11:30 we all decided to turn in. 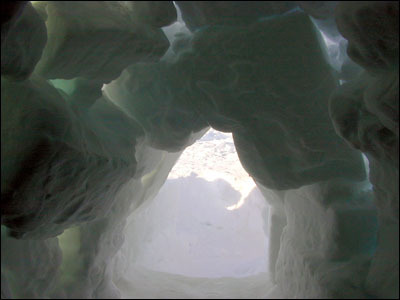 I have been saying since before I came here that I wanted to sleep in an igloo. So I did! I certainly did not get much sleep in that igloo. I have never been so cold in my entire life. I literally shivered all night long. Of course the wind really picks up in the evenings here so it was howling outside. The worst was having to get up to go to the bathroom. It is the last thing in the world you want to do, but one of the things they taught us is that that is one of the body's defenses in trying to warm itself. Be sure to drink a lot of fluids and then get rid of them. They also told us to be sure and eat during the night — candy bars, granola bars, etc. That will also help increase your body temperature. 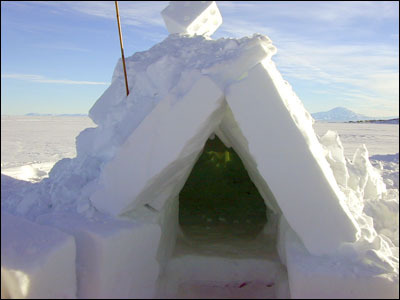 But having to get fully dressed and leave the igloo in that howling wind is terrible. Of course all of your clothes are very cold so putting them back on is not pleasant. They do warm up surprisingly fast, but still it is not fun. Especially when you are so tired. And remember that the sun is still shining. Actually that night we still had a bit of a sunset for about an hour and a half. I wish I could say that I was going to send home some of the most beautiful sunset photos of the mountains, but I was way too cold to even care. It was beautiful and I kept telling myself I was going to be sorry not to go in and get the camera, but I just was not able to do it. They tell you that one of the early symptoms of hypothermia is that kind of ambivalence. So I really needed to get back inside to the relative warmth of my sleeping bag, although warm is not any term I would use to describe it. Less cold is all I can come up with. As it turns out, I did end up getting just a little bit of what they call frostnip in my thumbs. It isn't terribly serious or permanent, but they were somewhat sore for a few days. At one point during the night I woke up (I guess I actually did sleep a little bit) and could not feel my nose. So I reached up to touch it and found it was as hard and stiff as a board. 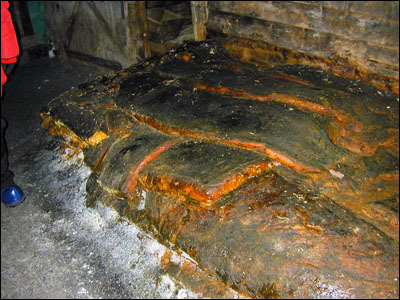 They had told us not to put our heads under the covers because of all the moisture we exhale, but at that point I did not care, I just wanted my nose to thaw out. Surprisingly no frostnip on the nose though. I thought morning would never come, but it did. 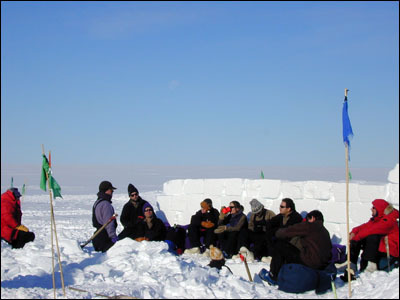 My igloo was very small and I could just barely sit up in it. If I sat too straight my head would touch the top and snow would fall down my back. Changing clothes was interesting to say the least. All of my clothes were frozen and stiff. My water bottle was also frozen. We had all put boiling water in our bottles before going to bed so that we would have a little warmth, but it was not long before it got cold and froze up. We have to wear sunscreen down here because of the hole in the ozone layer. Even though the sun never gets overhead, the UV rays are quite strong. However, my bottle of sunscreen was also frozen. It is really amazing. Amazing too that this is my very first camping trip EVER. 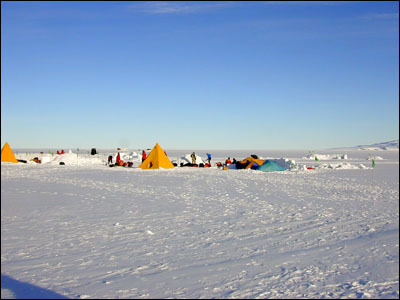 I never went camping growing up, so I had to come all the way to Antarctica to do it! I was the only one in class that had never camped before, much less winter camped. Those folks who slept in tents said they were just as miserably cold as the rest of us. We were very fortunate in that the weather was really quite nice, all things considered. You go through all of this training so that you will be prepared in case you get caught in a blizzard out in the field somewhere. I have heard that a couple of the classes this season were held during a condition 1 storm. Condition 3 is good weather and condition 1 the worst. I cannot imagine having to do all we did in such bad weather, But that is what it is all about. We all had oatmeal for breakfast, i.e., just add water. Then we packed up all the tents and gear. The instructors came back and we had a lesson on what to do if we were in a blizzard and someone wandered off and got lost. Basically we tied ourselves together and got bamboo poles to feel around with. 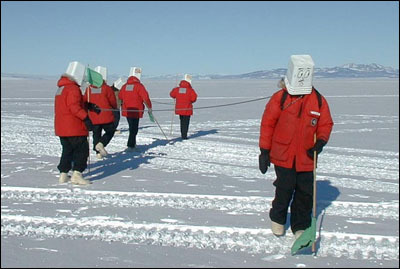 They made us put buckets over our heads to simulate a white–out and then we had to go try to find the instructor who was lying somewhere out in the snow. It was really pretty scary when you think about the fact that it does happen. Search and Rescue (SAR) is a big department down here. The next lesson was on the various radios available to us. 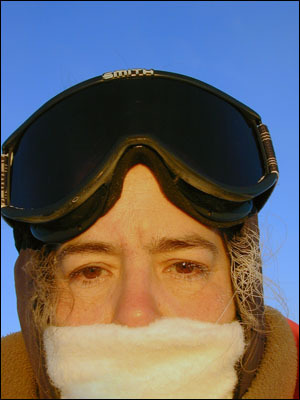 We set up the radios and antenna system and then had to contact the South Pole. One of the fellows in our class is from Italy so we then reset the antennas and contacted Terra Nova, the Italian base, about 300 miles away. That was fun. Our last lesson out on the ice was on emergency rescue. It was a timed lesson in which we had 12 minutes to set up two tents, set up the radio system and get a fire started. We came in 40 seconds under the limit. We then had lunch and headed back to town. Our final class of the day was helicopter school. There they teach you how to approach the helicopter, how to load the gear, how to strap yourself in, etc. I don't know if we will ever get the chance to ride in one, but they want you to know what to do if you should ever have to. We finally finished up around 4:00 P.M. I have never been so exhausted in my life. I wasn't this tired when I worked 84 hours straight at the Kravis Center. That shower when I got home and that bed I finally slept in was better than winning the lottery. I am really glad I had that opportunity and of course I hope I never really need to use what I learned, but it was quite a sobering experience. At least I know that if I ever did get caught in a blizzard somewhere, I would have some idea how to survive it. I always had a lot of respect for the early explorers of Antarctica, but now I am truly awestruck at their achievements. They didn't have any of the technology we have now, and the clothing couldn't begin to compare with what we have. Most of their clothes were not terribly warm and from the books I've read, they were wet most of the time. It must have been a grueling existence. They were all quite a breed of men. I took a trip yesterday to Cape Evans which is one of the huts that Sir Robert Falcon Scott built there around 1904. It is about an hour and a half trip over the sea ice to the cape. 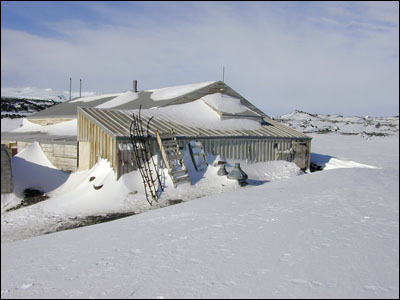 The hut that Scott built there when he was trying to be the first to reach the South Pole is still standing and looks as though they just left it. Some of the tins of things are rusted, but beyond that everything is the same. 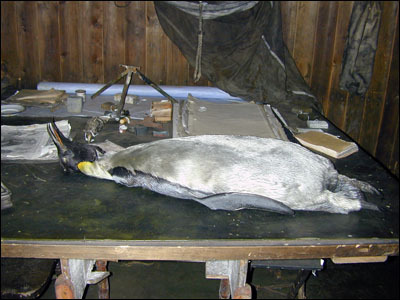 and a penguin that I believe they had been doing some research on. It looks like it died only a few days ago. Amazing. There was a darkroom set up with some old plates I would have loved to look at. There were stables attached to the house for the horses. Scott believed that horses would be the best animals for traveling here, and there are snowshoes for the horses hanging in the stables. Unfortunately, he was wrong about the horses and they all died here. 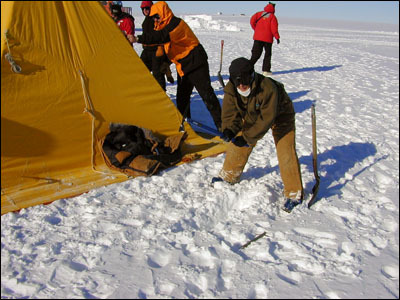 Scott reached the South Pole only to discover that Amundsen had gotten there before him. 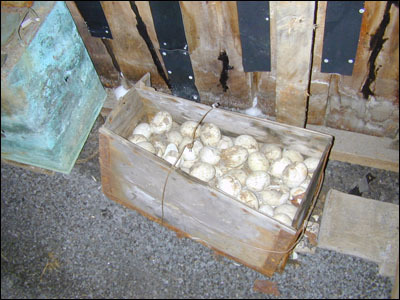 Scott and his companions were caught in a blizzard on the return trip and froze to death, just 11 miles from their destination. 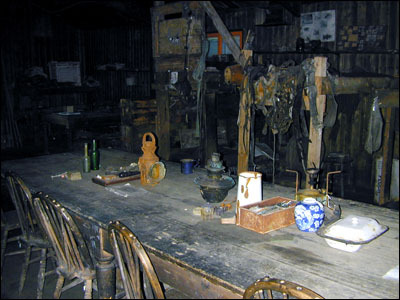 There are several old photos of Scott's team seated around a long table inside the hut. It is almost chilling to see the same table just as they left it. In 1914–1916 Sir Ernest Shackleton planned a trans–Antarctic trip beginning near the Weddell Sea. His boat was frozen in the ice and it took two years before they were finally rescued. His book South is one of the great adventure stories of all time. I could not put it down. 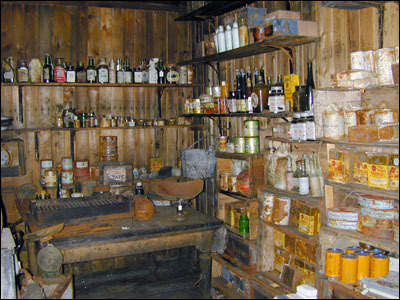 The other half of his party was on this side of Antarctica and actually made use of Scott's hut at Cape Evans when their ship was lost. On a nicer note, we have actually had "freshies" in the galley so we've been eating salads and fruits. It is quite a luxury here. It is hard for me to fully realize as I have only been here 2 weeks, but for those who spent the winter here without ever having any, I am sure it's a real treasure. I miss the milk the most. All we get here is powdered milk and it is really awful. I have even stopped putting milk in coffee or tea. 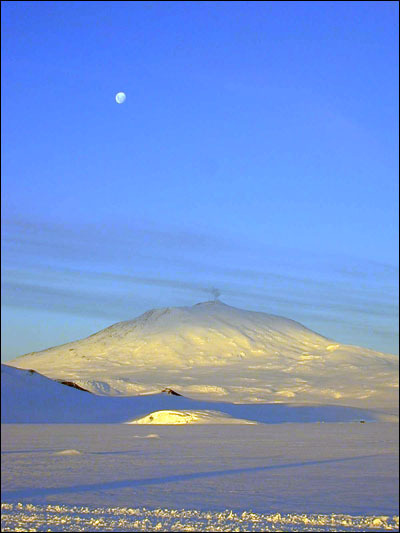 If you go to the Antarctic Sun web page you can access our local newspaper here on base. You may find it interesting. It generally has something about the history of Antarctica and about the science that's going on here, and also about some of the people. It also has a schedule of events going on around town. Try to check it out if you can.